to confirm availability (English-speaking staff). 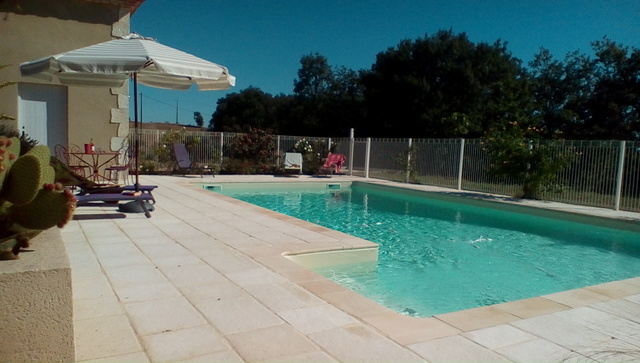 A beautifully appointed and fully renovated property with private pool located within a short drive of the well known town of Auch with all amenities. The tiny village of Auterive is a stone's throw away and has a café and boules court, with Pessan and Pavie just 4 miles away for basic shopping. Set in just under 1 hectare of land, with ample interior space and a good ratio of bathrooms to bedrooms, this property is ideal for a quiet relaxing holiday for one or two families or a group of couples. 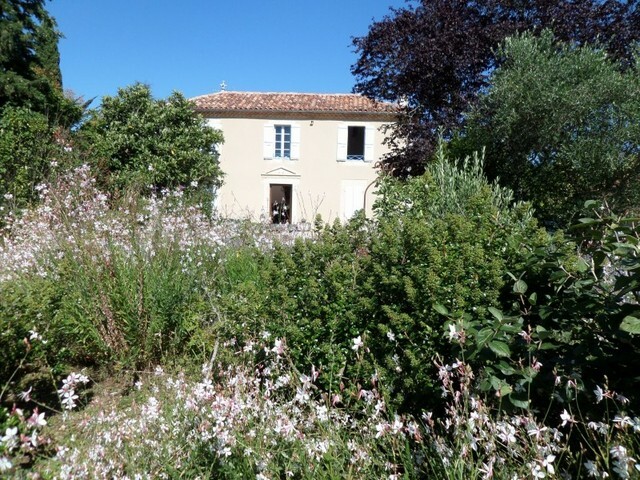 Approached via a quiet lane and then along its own private driveway, this imposing Maison Bourgeois dating from 1804 is surrounded by lawns, pretty gardens, its very own boules court and, to the left, a fully fenced newly installed pool with large sunbathing terrace and pigeonnier. 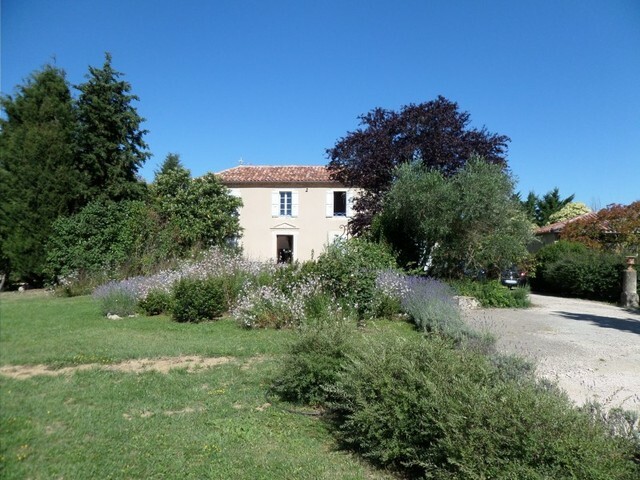 At the rear of the property the substantial grounds provide ample play area for children and have gorgeous views of the Pyrénées. There is a Gasçon pond within the grounds which is fenced off. On entering the property via the solid entrance door the tiled hallway leads through to the large kitchen/dining room. Fully equipped with a double Belfast sink, all appliances including a large range-style oven and ample work surfaces, the large dining table sits in the middle of the room and enjoys views out to the rear terrace, grounds and mountains beyond. To the left of the dining area a large stone opening gives access to one of two characterful sitting rooms with tiled floor, feature windows, exposed stonework and wood burning stove. From this sitting room a door leads out to a terrace to one side of the property which overlooks the pool. Returning to the entrance hallway gives access to three bedrooms (one double, one twin and one single) which are all tiled and are individually decorated, the twin retaining the original fireplace. Above the double bedroom, at the sunny mezzanine level, are two single beds for those parents who prefer to have young children in close proximity. Both the single and double bedrooms have doors leading to the garden with small private terraces, one of which is covered. Also on the ground floor are two tiled family bath/shower rooms (one with hand held shower over the bath and one with a walk-in shower), a good sized laundry room and the second sitting which has an impressive library of books, exposed beams, a stone fireplace and tiled flooring. The original turned wood Gasçon staircase sweeps up to the first floor where there are two very large bedrooms with wooden floors. The master bedroom has ensuite facilities, whilst both bedrooms have oak parquet flooring and feature fireplaces. Outside the large barn/games room may be accessed offering both table tennis and pool tables, and in a quiet corner of the grounds this property has its very own boules court. 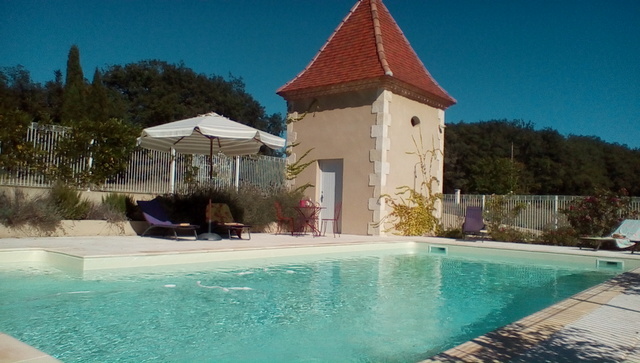 All in all a lovely property with a very welcoming feel and ideally placed to explore the many sites and activities offered in this lovely part of France. PLEASE NOTE: Within the grounds is a small apartment which does not overlook the rental property and where the guardian is sometimes in residence when maintaining the pool and grounds. The pool, property and grounds are exclusively for the private use of guests. Within the grounds is a small apartment which does not overlook the rental property and where the guardian is sometimes in residence when maintaining the pool and grounds. The pool, property and grounds are exclusively for the private use of guests.